Equation (28) is identical to equation (17), for the case in which all eliminated drug was excreted unchanged in urine. (D1 — DU is the ARE, and equation (28) shows that an ARE plot of unchanged drug in urine versus time will be a straight line with a slope providing a value of kel even when the drug is partially eliminated by metabolism (Figs. 6 and 7). using equation (27) and the total amount of unchanged drug excreted in urine (D1), it is possible to calculate ke. Also, km can be calculated from equation (24). 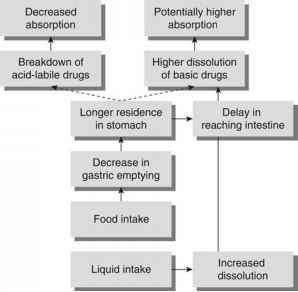 Thus, all the rate constants in Scheme 2 can be calculated solely on the basis of urinary excretion of unchanged drug. Example. Five hundred milligrams of a drug was administered IV to a normal healthy volunteer, and various amounts of unchanged drug were recovered from the urine over the 24-hour postdrug period (Table 4). Calculate kei, ke, and km for this drug. A plot of (D1 — Du) on a log scale versus time is shown in Figure 7. 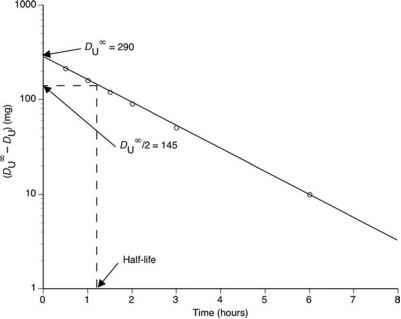 A half-life of 1.2 hours can be estimated from the line in Figure 7.